The Smithsonian Astrophysical Observatory announced August 22nd that the 2009 Edgar Wilson Award for the discovery of comets is being divided among five individuals for five different comets. Robert E. Holmes, Jr. (Charleston, IL, U.S.A.) for C/2008 N1, Stanislav Maticic (Crni Vrh Observatory, Slovenia) for C/2008 Q1, Michel Ory (Delemont, Switzerland) for P/2008 Q2; Koichi Itagaki (Yamagata, Japan) for C/2009 E1, and Dae-am Yi (Yeongwol-kun, Gangwon-do, Korea) for C/2009 F6. Each award is composed of a monetary award from the Edgar Wilson Charitable Trust Fund and an award plaque. The award is given annually to the amateur astronomers who, using amateur equipment, have discovered one or more new comets. 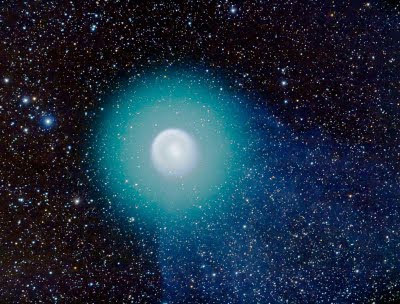 Only comets officially named for their discoverers shall be included in the annual count. Past winners include, David H. Levy, Tucson, AZ, U.S.A. (P/2006 T1), Donald Edward Machholz, Jr., Colfax, CA, U.S.A. (C/2004 Q2), William A. Bradfield, Yankalilla, S. Australia (C/2004 F4), and some variable star observers I know, among them; Vance Avery Petriew, Regina, SK, Canada (P/2001 Q2), Albert F. A. L. Jones, Stoke, Nelson, New Zealand (C/2000 W1), and Peter Williams, Heathcote, N.S.W., Australia (C/1998 P1). It is amazing to me the number of comets still discovered by amateurs each year, and how many of them are made the old fashioned way- visually. 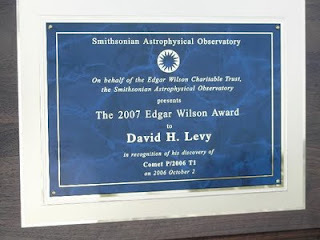 During the first eight years of Wilson Awards (1999-2006), 17 awards went to visual discoverers of comets, 10 awards went to CCD discoverers, and one award went to a photographic discoverer of a comet. Congratulations to this year's amateur comet sleuths.